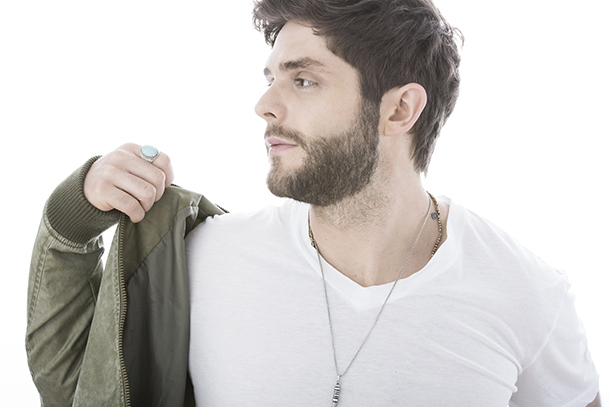 Thomas Rhett holds down #1 while three new singles hit the Top 30 and Top 10 for the first time! Three of the Top 5 songs from last week's report (click here to view) remain in the same positions this week as Thomas Rhett's "Die A Happy Man" spends yet another week at #1 on our chart. Rhett's single has now scanned digital platinum but with new RIAA certifications now incorporating streams for videos/tracks from official video pages on YouTube, Vevo, CMT and other licensed video outlets, look for it to hit Double Platinum soon too, something which will happen as well to many of the songs from the #2 singer on this chart, Sam Hunt, with this week's song "Break Up In A Small Town." At #3 is Tim McGraw with a 41 slot jump with his latest "Humble And Kind." The Lori McKenna ("Girl Crush")-penned tune is certainly resonating with audiences everywhere. It had a sales increase of nearly 469% over last week (from nearly 5k to over 27k). Luke Bryan and Karen Fairchild's "Home Alone Tonight" sits at #4 with sales of 295k to date while Cole Swindell's "You Should Be Here" is next with sales approaching 200k. Dierks Bentley's "Somewhere On A Beach" moves from #8 to #6 this week with a 16% sales increase in its second week on the charts. The song has sold 41k in two weeks. At #7 is "Drunk On Your Love," the second single from ACM Male Vocalist of the Year nominee Brett Eldredge's Illinois album (his Bring You Back debut was certified Gold by the RIAA this week). At #8 is another fast-rising single, Maren Morris' "My Church." Like Tim McGraw, Chris Young and Cassadee Pope's "Think of You" duet is a fast riser from outside the Top 30 into the Top 10 as it jumps 65 spots for the 4x ACM nominee. The single has scanned over 46k to date. Debuting at #10 is Steven Tyler's "Red, White & You." The song, which is the rock star's second solo country single, scanned 16k in its first week on this chart. Carrie Underwood's "Heartbeat" is at #12 this week (with a slight sales increase) while Love and Theft sit at #15 with "Whiskey On My Breath," their indie single which is sitting outside radio's Top 40 but benefitted from Bobby Bones radio airplay last week. The single has now scanned over 96k to date, not bad for a song that's never been a radio hit (it has outsold a handful of big radio hits). Chris Stapleton's "Nobody To Blame" and "Tennessee Whiskey" (the latter a Gold-eligible single) sit at #16 and #17. Jon Pardi "Head Over Boots" sits at #27 with a slight sales increase and has now sold over 105k to date. Lee Brice "That Don't Sound Like You"
Taylor Ray Holbrook "Tie Me Down"
Miranda Lambert "Sweet By And By"